Developed by the Child and Family Center at the University of Oregon, Family Checkup: Positive Parenting Prevents Drug Abuse highlights parenting skills that are important in preventing the initiation and progression of drug use among youth. NIDA TV interview with Communities that Care Co-Developer, Dr. David Hawkins, following his discussion on treating addiction through a community supported science-based approach. The National Institute on Drug Abuse hosted the presentation of Dr. Hawkins' introduction of electronic training for CTC in Rockville, Maryland, February 2014. Update on Communities That Care prevention program. 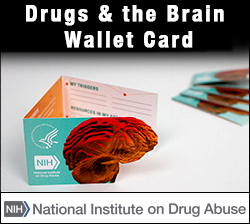 To celebrate recent advances in drug prevention science, the National Institute on Drug Abuse (NIDA) a part of the National Institutes of Health (NIH), sponsored its first virtual town hall meeting. This unique event on September 9, 2009 brought together representatives from key federal agencies involved in preventing and combating substance abuse in the United States. Federal School Resource Guide Now Available - The White House Office of National Drug Control Policy has released a resource guide for evidence-based prevention programs in school settings. The resources included in this guide are available free from the federal government and can help educators protect students and schools from the impact of illicit substance use and misuse. NIDA. "Prevention." National Institute on Drug Abuse, 31 Mar. 2014, https://www.drugabuse.gov/related-topics/prevention. NIDA. Prevention. National Institute on Drug Abuse website. https://www.drugabuse.gov/related-topics/prevention. March 31, 2014.